Liverpool hammered Watford by 6 goals to 1 at Anfield on Sunday afternoon and now top the Premier League by one point on 26 pts ahead of Chelsea, Arsenal, Man City and Spurs, all below us. Happy days for Liverpool fans especially after the margin of victory against Walter Mazzarri's team with Mané, Coutinho, Firmino, Can and Wijnaldum all hitting the back of the net in 90 minutes. 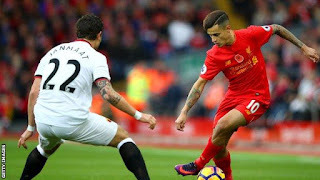 Yes there were moments of indecision and poor play at the back which would have been punished by top four teams surely, but by and large, it was an overwhelming display of attacking dominance by Jurgen Klopp's Liverpool. Liverpool are setting the standards for football quality this Season that few will be able to match.